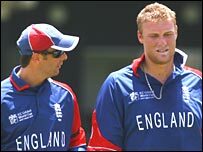 England captain Michael Vaughan says Andrew Flintoff's drunken antics at the World Cup damaged team spirit. Flintoff lost the vice-captaincy after getting into difficulty in a pedalo after going out drinking following the team's defeat by New Zealand. "That changed the whole atmosphere in the camp," Vaughan told the Guardian. "We went into the New Zealand game with a good attitude but didn't play well and after 'Fredalo' we just started taking it all too seriously." Flintoff was one of six players fined for a breach of team discipline after the six-wicket defeat. "Suddenly you've got players who have no freedom left. I like to see players enjoy themselves but no one would dare go out after that incident - and you can't create any spirit then. "That might sound silly but everyone was too tense and desperate. There was no escape - and even on the field you have to be pretty free, especially in one-day cricket," said Vaughan. Morale in the camp never fully recovered, he added, which contributed to England's disappointing results. Although they progressed safely through the first round phase and finished fifth in the Super 8s table, their only wins over other Test-playing sides came against Bangladesh and West Indies - and the latter was a dead match with neither side able to reach the semi-finals.